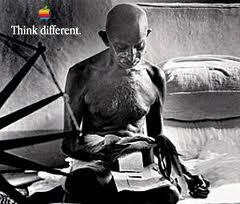 A long time ago, in technology years, a mid-size company made a name for itself with a tagline of "Think Different". They had identified a set of industry challenges and set out to address them with innovations originating in Xerox PARC, and implemented through their creative genius and technical abilities. Much more recently the President's Council of Advisors on Science and Technology(PCAST) issued a similar "think different" challenge to the healthcare technology industry and to the government leadership for health IT, contending that internet technology advances can help to address a number of critical issues for the healthcare system. The healthcare system structure limits incentives for care coordination, information sharing and cost reduction. The current structure of health IT systems makes it difficult for providers and patients to access and use needed health information across organizationas and across various settings of care. The limited data exchange also hampers researchers and public health agencies access to information needed for comparative effectiveness and biomedical research. Current health information exchange effectiveness is burdened by administrative requirements and has not proven their ability to scale out nationally. PCAST argues that "if health information technology is to have a truly transformative effect, the Federal Government should push ambitiously toward a national health data infrastructure in which patient data are readily available to providers in real time, can be accessed in de-identified form by researchers and public health agencies, and in which a market for applications that enhance EHR usability and patient involvement can flourish, enabling a “network effect” that can spur further adoption. The report describes a technological approach that could lead to this vision being realized, while at the same time strongly protecting privacy (including, where applicable, respecting the persistent privacy preferences of patients), and also describes some of the accompanying economic and regulatory steps that are required." "Accelerate progress toward a robust exchange of health information. Establish a new exchange architecture with a universal exchange language (UEL) and interlinked search capabilities coupled with strong privacy and security safeguards. The exchange architecture will enable clinicians and patients to assemble a patient's data across organizational boundaries and facilitate population health. Establish an evolutionary transition path from existing installations to the new exchange architecture." "Every American will have electronic health records and will have the ability to exercise privacy preferences for how those records are accessed, consistent with law and policy. Subject to privacy and security rules, a clinician will be able to view all patient data that is available and necessary for treatment. The data will be available across organizational boundaries. Subject to privacy and security rules, authorized researchers and public health officials will be able to leverage patient data in order to perform multi-patient, multi-entity analyses." Elaborating on how these recommendations could be integrated into the ONC strategic framework. "The PCAST report describes a national use of advanced technology. It provides a compelling vision for how that technology could be beneficially used as an important aspect of the learning health system. There are major policy and operational feasibility concerns with the proposed technology. Aggressive and rapid progress is possible only with an incremental test-bed approach. Large operational tests are needed that resolve the policy and feasibility concerns." The Workgroup did some excellent work on deployment models, implementation strategies, technical framework components, policy considerations and "paths of least regret" for Stage 2 meaningful use. Digging into the Workgroup's dialog, there are also real issues with applying the PCAST primarily technical recommendations to practice and business of healthcare. Some of these include managing privacy consent through DEAS, provenance, state health information policy compliance, consistency with fair information practices, alignment with other HIE initiatives and unlocking/retention of data. "The ultimate challenge is to find the correct balance between the inspirational goals of the PCAST report and the practical realities of a nationwide deployment of electronic health records. We respectfully submit this letter hoping that it will assist ONC in achieving that balance." Barry Devlin: "The Heat Death of the Data Warehouse"
Intensive care units (ICUs) in both large and small hospitals stopped central line-associated bloodstream infections for up to 2 years after using a targeted quality improvement initiative. The initiative, known as the Comprehensive Unit-based Safety Program, or CUSP, was implemented through the Keystone Intensive Care Unit Project in Michigan hospitals. The study, "How Long Can Intensive Care Units Maintain Zero Central Line-Associated Bloodstream Infections?" published in today's issue of the Archives of Internal Medicine found that hospital ICUs eliminated central line-associated bloodstream infections (CLABSIs) for an extended period of time—up to 2 years or more. The researchers found that 60 percent of the 80 ICUs evaluated went 1 year or more without an infection, and 26 percent achieved 2 years or more. Smaller hospitals sustained zero infections longer than larger hospitals, the researchers found. A CLABSI is a serious healthcare-associated infection (HAI) that is introduced into the bloodstream through a central line. According to the Centers for Disease Control and Prevention (CDC), at any one point in time one in every 20 hospital patients in the United States has an HAI. The Keystone Project used a comprehensive approach that included promoting a culture of patient safety; improving communication among ICU staff teams; and using a checklist to promote implementation of practices based on guidelines from the CDC. For more information on CUSP, go to http://www.ahrq.gov/qual/cusp.htm. As the US healthcare system transitions from a pay-for-service model to pay-for-value through new arrangements including bundled payments and the Accountable Care Organization (ACO), healthcare organizations will require advanced analytics solutions to track, analyze and report on quality and cost across every care setting. Allscripts and Humedica today announced their collaboration on a next-generation cloud-based clinical informatics platform that will help physicians and hospitals succeed in the coming era of value-based reimbursement, addressing a fundamental shift in the way healthcare providers are paid. Provider organizations need robust operational and outcomes benchmarking and comparative analyses. The solution will enable organizations to manage quality and risk to drive improved outcomes in a complex environment - across all settings of care and even when they are using disparate clinical systems. Humedica has been providing comprehensive clinical analytics to leading medical groups across the country through its long-term partnership with the American Medical Group Association and its medical informatics subsidiary, Anceta. "Having worked closely with both Allscripts and Humedica, we are excited that the two organizations are partnering," said C. Edward Brown, FACHE, Chief Executive Officer of The Iowa Clinic, the largest physician-owned multispecialty group in Central Iowa. "We have been extremely satisfied with both the Allscripts Electronic Health Record and the Humedica MinedShare® solution." "To succeed in the era of payment reform, healthcare organizations need visibility into quality and cost across every care setting with the ability to track the performance of each provider, organization and at-risk patient in the care process," said Glen Tullman, Chief Executive Officer of Allscripts. "Our partnership with and strategic investment in Humedica augments our successful reporting and analytics solutions, with a cloud-based informatics engine that's fine-tuned to meet some of the most pressing challenges of payment reform. In addition, because some of our key clients already have adopted Humedica, we've had the opportunity to see how powerful the solution is and how much more we could do together to advance patient care. " "Clinical insights gained through analyzing data in the Electronic Health Record and other applications can give healthcare organizations unprecedented visibility to the total clinical risk, true clinical performance and best practices necessary to optimize population health," said Michael Weintraub, President and Chief Executive Officer of Humedica. "Our partnership with Allscripts ultimately will enable healthcare organizations to translate analytics into actions that help them succeed in the era of healthcare reform." "I have no doubt that many member organizations of the American Medical Group Association, like the Iowa Clinic, will benefit from the relationship between Humedica and Allscripts," said Donald W. Fisher, Ph.D., President and Chief Executive Officer of AMGA. "Multi-specialty medical groups need sophisticated informatics, including in-depth clinical analytics, to assume a leading role in transforming healthcare, through ACOs and other value-based payment models." Rich Elmore, editor of Healthcare Technology News, is Vice President, Strategic Initiatives at Allscripts.